Al Cielo Penthouse Punta Roca 402, Puerto Aventuras is an amazing and luxurious home with four en suite bedrooms! A huge private roof deck offers a Jacuzzi, chaise lounges, al fresco dining, gas bbq grill, sitting area boasting incredible ocean views! 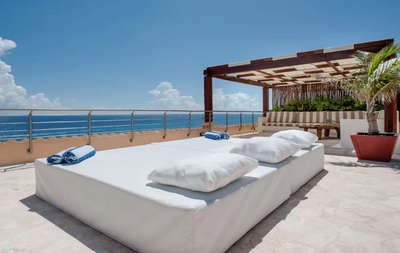 Vacation the luxurious way at Al Cielo Penthouse villa, with over 2 900 square feet of luxurious living, multiple terraces and 1800 square feet of roof top deck. Entering Al Cielo Penthouse you are greeted by the glistening blue ocean from beyond the large open plan living room. The living room is very comfortable with a huge flat screen TV, the dining area has seating for eight. The gourmet kitchen with all modern conveniences will please the most aspiring chef! The owners of Al Cielo Penthouse provide guests with complimentary wireless internet and Vonage telephone for Free calls to the United States. Leading from this area are four luxurious bedrooms with en suite bathrooms. Wake up each day of your vacation to amazing ocean views in the master king suite, walk out to a large terrace that covers the length of the home, equipped with comfy seats, perfect for relaxation and watching the boats go by! The second suite has king bed and walk out to a terrace, the third guest suite has two full beds and the fourth suite has two twins (may also be a king bed on request). From the living area there is a stairway leading up to the incredible roof top deck, relax on chaise lounges taking in the view, have a blissful ocean front massage, enjoy your favorite cocktail in the comfy seating area, cook up the catch of the day on the gas barbecue grill and dine alfresco day or night, hours of fun are guaranteed. The Fatima bay sandy beach is close by as is the San Carlos marina with many restaurants, bars boutiques, diving, fishing and much more. Puerto Aventuras is in the heart of the Riviera Maya with many beautiful attractions close by. Suite 1 (Master) 1 King	 2 TV. Security safe for valuables. Suite 2 1 King	 2 TV. Security safe for valuables. Suite 3 2 Double	 2 TV. Security safe for valuables. Suite 4 2 Single/Twin	 2 TV. Security safe for valuables. Private rooftop deck with Jacuzzi, chaise lounges, alfresco dining area, barbecue and lounging area. Crib and Pack N Play available for guest use. Daily housekeeping services (Monday to Saturday). 3 bedroom bookings have cleaning service twice weekly. Chef services, tours and spa treatments available (extra cost).